The mere fact real estate is a hard asset lends it a distinct advantage over other, more abstract alternatives. Subdued economic growth with the odd spat of volatility means that, while conditions are less than advantageous for financial markets, they have supported growth in the real estate sector. Where investors in years past have ploughed their money into high-risk, high-reward opportunities, an uneven recovery has given rise to a more cautious approach that may well squeeze profits – though by no means dampen enthusiasm – for the real estate sector. Institutional investors are only now starting to pull back from these opportunistic investments, with interest rates and cap rates on the rise. Investors are gravitating towards low risk deals, even if that means lower returns, and are generally waiting on markets to improve before they resort to their old ways. The focus for now at least is on real estate fundamentals, and on leveraging what cost efficiencies they can in what remains a tight operating environment. These shifts make for a highly complex – and sometimes confusing – marketplace. Yet real estate is on the up. Volatility is highlighting the industry’s relative safety, and money typically invested in commodities is being diverted, with rising prices in key cities across the globe becoming by far the better option. Cushman & Wakefield is of the opinion that new sources of capital, unsatisfied demand and strong supply of debt are all likely to result in global real estate trading, whereas volatility elsewhere is having a significant impact. What’s more, given the real estate market makes up such a key component of the global economy – even more so in times of high volatility – the companies operating in this space will have the world’s attention fixed on them. Having rebounded considerably over the past year, the real estate market is expected to strengthen further over the coming months, in large part due to the winners of this year’s World Finance Real Estate Awards. The 2016 awards have been presented to the most impressive names in the business, and as governments around the world attempt to stimulate their economies through fiscal reform, we pay tribute to the private property and construction firms that are doing their bit. Although there are challenges to be faced for the real estate sector, investors are generally bullish about its prospects. In fact, real estate is something of a rarity in that it’s one of a few sectors where solid and consistent returns are near enough guaranteed – not just in emerging markets, but in mature ones too. Most equities are either flat or negative, and a variety of factors have inflicted pains on financial markets, including an end to quantitative easing in the US, the slowdown in China and the collapse in oil prices. Real estate represents a relative safe haven, as it is one of very few sectors where investors are unanimously confident. San Francisco, New York and Los Angeles are the US’ hot spots, whereas in Europe London is by far and away the most popular destination, followed by Paris and Frankfurt. In the Asia-Pacific region, Japan and Australia have come out on top, with Tokyo, Sydney and Melbourne making up the top three locations. Looking at the situation as it stands, it’s clear the foundations have been laid for what promises to be a fruitful period for property and real estate. One area in which investors are taking a notable interest is in commercial real estate, where the benefits are more prominent than arguably any other sector. In major markets around the world, commercial property prices have risen substantially, and positive changes in fundamentals and rising expectations of growing cash flow have push prices upwards. The lingering concern is a housing boom in more developed markets could impact affordability and seriously compromise appetite for real estate. The latter stage of this decade could therefore see growth continue but at a slower pace, meaning real estate investors must look to niche areas of the sector if they are to preserve capital and promote sustainable growth. Stephen Phillips, President of Berkshire Hathaway HomeServices, insisted in an interview with Business Insider that the market is at a turning point with regards to the gap between prices and wages. New builds and intelligent investment will go some way towards rectifying the gulf in wages and prices. Property and real estate act as the building blocks on which budding and healthy economies are built. As governments seek to make their economies and infrastructure fit for a modern world, real estate and construction firms are helping to drive this vital area of growth. 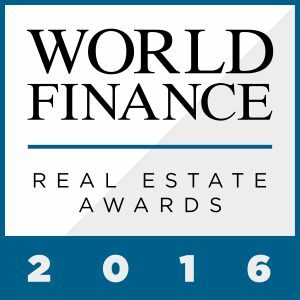 The World Finance Real Estate Awards offer an insight not only into what it takes to succeed in today’s market, but into the ways in which the industry is likely to change in the coming years. By looking at a wide cross-section of performance indicators, the judging panel at World Finance, together with our readers, have picked out the brightest names in the business.